Facebook CEO Mark Zuckerberg expressed his “deep disappointment” after his $200 million satellite that was to be launched by Elon Musk’s SpaceX exploded on the Cape Canaveral launch pad on Sept. 1. “As I’m here in Africa, I’m deeply disappointed to hear that SpaceX’s launch failure destroyed our satellite that would have provided connectivity to so many entrepreneurs and everyone else across the continent,” Zuckerberg said. Musk, in a tweet, hinted that Zuckerberg may have jumped the gun by blaming SpaceX. Musk said the cause of the explosion during a routine pre-launch test is still unknown. The satellite was intended to bring internet access to parts of sub-Saharan Africa. “We remain committed to our mission of connecting everyone, and we will keep working until everyone has the opportunities this satellite would have provided,” Zuckerberg said. 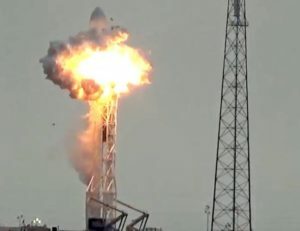 Meanwhile, Musk lost about $390 million as the stock prices of two of his companies, Telsa and SolarCity, dropped after the incident at Cape Canaveral. The satellite, designed to connect the world to the web through Facebook’s Internet.org free mobile data scheme, has been slammed by online right’s groups. In an open letter, 67 online rights’ groups said the project threatened freedom of expression, privacy and the principle of net neutrality – the idea that all data is treated equally online – because only selected services could take advantage of it. Zuckerberg noted that access is offered as a partnership with local mobile operators, which agreed to offer certain services for free with an option to get the full internet with a paid subscription.